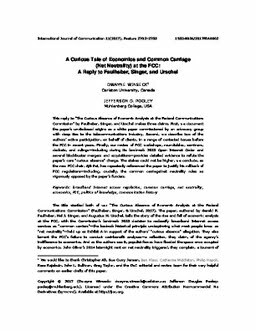 This reply to "The Curious Absence of Economic Analysis at the Federal Communications Commission" by Faulhaber, Singer, and Urschel makes three claims. First, we document the paper's undisclosed origins as a white paper commissioned by an advocacy group with deep ties to the telecommunications industry. Second, we describe two of the authors' active participation, on behalf of clients, in a range of contested issues before the FCC in recent years. Finally, our review of FCC workshops, roundtables, seminars, dockets, and rulings-including during its landmark 2015 Open Internet Order and several blockbuster mergers and acquisitions-provides detailed evidence to refute the paper's core "curious absence" charge. The stakes could not be higher, we conclude, as the new FCC chair, Ajit Pai, has repeatedly referenced the paper to justify his rollback of FCC regulations-including, crucially, the common carriage/net neutrality rules so vigorously opposed by the paper's funders. Winseck, D, & Pooley, J.D. (Jefferson Douglas). (2017). A Reply to Faulhaber, Singer, and Urschel’s Curious Tale of Economics and Common Carriage (Net Neutrality) at the FCC. International Journal of Communication, 11, 2702–2733.